Flexibility Solutions for High-Renewable Energy Systems, a new pair of reports published today by BloombergNEF in partnership with Statkraft and Eaton, explores the possibilities for solving the power system flexibility challenge in the U.K. and Germany. The studies analyse the potential contributions of energy storage, demand response, flexible electric vehicle charging and interconnections to Nordic hydro in enabling the renewable energy transition. New forms of flexibility are key to an affordable, renewables-led power system. Without energy storage, smart-charging electric vehicles, demand response and interconnectors, the energy transition risks proceeding on a suboptimal path, with a power system reliant on fossil backup and oversized renewables capacity that will come at a higher cost. Building on BloombergNEF’s flagship forecast for the global electricity system, the New Energy Outlook (NEO), this study explores alternative futures for the power system, depending on how each flexibility technology might develop in the coming years. It uses BNEF’s proprietary New Energy Outlook modelling tools, meaning that every scenario is, for the given assumptions, a least-cost optimal solution. Each scenario starts with different underlying assumptions about what each technology can provide, and/or at what cost. Download the UK report here, and the Germany report here. We find that, in general, flexible technologies help integrate large volumes of renewable generation by shifting excess demand to periods of high renewable generation, or by storing the excess renewable generation for periods of high demand. This comes with important benefits in terms of system costs and carbon emissions. However, while in the U.K. new sources of flexibility mainly help to displace fossil backup capacity, that is not always the case in Germany, where flexibility can support cheap, inflexible coal generation in some scenarios. This highlights the importance of addressing coal generation in Germany through policy action, to ensure a low-carbon transition. 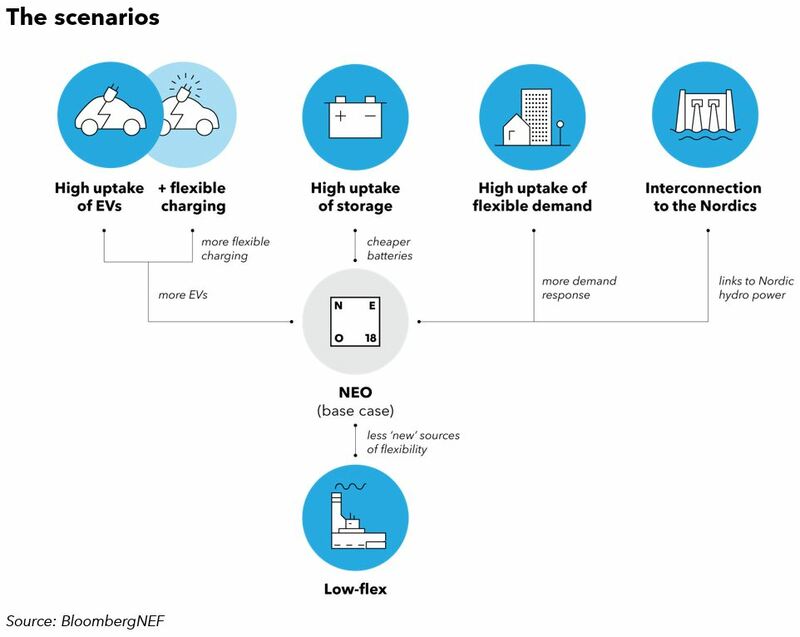 More energy storage and flexible demand can accelerate the transition to a renewable power system, displacing fossil backup by up to 12% in some cases (compared to the NEO base case). If new sources of flexibility are adopted in a more limited fashion, the transition to a low-carbon power system will come at a real cost. Our U.K. low-flexibility scenario results in a system that is up to 13% more expensive by 2040. The same scenario for Germany would come at a cost premium of 8%. The British system in our low-flexibility scenario also results in over a third more emissions than the NEO base case. Greater electrification of transport yields major emissions savings with little risk to the power generation system. In some cases with highly flexible charging, rapid EV adoption can actually reduce power system emissions by supporting renewable energy, even before considering avoided tailpipe emissions. Interconnection with the Nordics can provide a formidable source of flexibility for decades that can reduce emissions by up to 25% and the need for fossil capacity by up to 10% by 2040. The role of interconnectors changes over time, and can help to provide seasonal balancing in later stages of the forecast period. For full analysis and findings, download the U.K report here, and the Germany report here.